Hi everyone! I hope you all had a wonderful Easter and Spring Break! I have a few new updates to share with you! 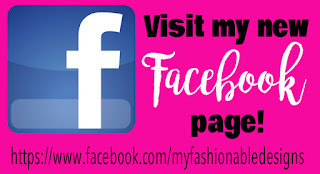 First, is my new Facebook page where I will be posting new additions to my Etsy shop, freebies, coupon codes, and be able to communicate better with customers! Please spread the word, tag your friends on my posts, and comment....I would love to meet you! Next, I have decided to start phasing out the "Fashionable Moms" header and start using My Fashionable Designs for everything blog and Etsy-related. When I started this blog several years ago, I wanted it to be a place where moms could go to read about fashion and makeup and all that fun stuff that I love! But as my creativity has changed, and my love for graphic design has grown, I decided it was time to take this blog in that direction. I love helping others by providing printables and ideas that will help make a task easier, a project easier, a ceremony easier, a party easier....etc...you get the idea! I love your emails and comments, and sometimes life gets crazy and I don't respond to each of them, but I am trying to get better!😀 I'm very excited for the future and the opportunity to continue to meet so many new friends!